One of the world's most dangerous Android and iPhone spyware program has been found deployed against targets across 45 countries around the world over the last two years, a new report from Citizen Lab revealed. Pegasus is NSO Group's most powerful creation that has been designed to hack iPhone, Android, and other mobile devices remotely, allowing an attacker to access an incredible amount of data on a target victim, including text messages, calendar entries, emails, WhatsApp messages, user's location, microphone, and camera—all without the victim's knowledge. Now, a new report released Tuesday from the University of Toronto's Citizen Lab revealed that the Pegasus infections have victimized more countries than previously believed. Citizen Lab last month said that it had so far counted as many as 174 publicly-reported cases of individuals worldwide "abusively targeted" with NSO spyware, but now found traces of Pegasus infections across as many as 45 countries. The report further said that while some NSO customers may be lawfully using Pegasus, at least 6 of those countries with significant Pegasus operations were "known spyware abusers," which means they have previously been linked to the abusive use of spyware to target civil society. 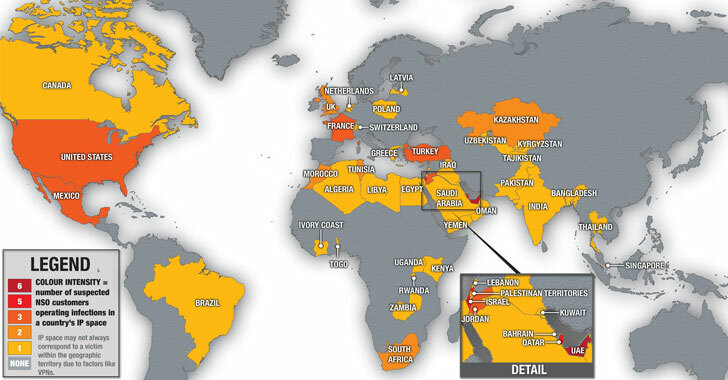 These "known spyware abusers" include Bahrain, Kazakhstan, Mexico, Morocco, Saudi Arabia, and the United Arab Emirates. The list of countries targeted by Pegasus includes Algeria, Bahrain, Bangladesh, Brazil, Canada, Cote d'Ivoire, Egypt, France, Greece, India, Iraq, Israel, Jordan, Kazakhstan, Kenya, Kuwait, Kyrgyzstan, Latvia, Lebanon, Libya, Mexico, Morocco, the Netherlands, Oman, Pakistan, Palestine, Poland, Qatar, Rwanda, Saudi Arabia, Singapore, South Africa, Switzerland, Tajikistan, Thailand, Togo, Tunisia, Turkey, the UAE, Uganda, the United Kingdom, the United States, Uzbekistan, Yemen, and Zambia. "Contrary to statements made by you, our product is licensed to government and law enforcement agencies for the sole purpose of investigating and preventing crime and terror. Our business is conducted in strict compliance with applicable export control laws," NSO Group spokesperson Shalev Hulio told Citizen Lab. "NSO’s Business Ethics Committee, which includes outside experts from various disciplines, including law and foreign relations, reviews and approves each transaction and is authorized to reject agreements or cancel existing agreements where there is a case of improper use."